Contrary to popular belief, a few power bars and a bottle of water aren’t going to get you very far in a survival situation. While hunger is an ever-present issue during a crisis, water is the single most important resource the body needs to survive and should always be a priority. But preparing and cooking hearty food is much more difficult during a disaster situation, making it a challenge and increased priority to provide the body with proper nutrition. That’s why soup is one of the best meals to make to provide the body with much needed energy during a survival situation. Soup is a means to provide the body with both nutrients in the form of fats and proteins and hydration in the water it contains. The main ingredient in every store-bought or homemade soup is water–making it a great meal to curb the effects of dehydration, which can be deadly in an emergency situation. Soup is also an all-purpose aid in alleviating many common illnesses–just think of how much your mother forced on you as a child on sick days. Just a few nutrient-packed ingredients can turn a simple pot of boiling water into hearty meal. Pasta, rice, grains will add extra calories and consistency while meat and vegetables will enhance the nutritional value and the flavor. In a survival situation, soup can be a great way to consume any dehydrated or canned vegetables you make yourself and use up other dried and flavor-concentrated products around the house. Making soup is also a great way to stretch a meal to feed an entire family or group caught together during a crisis. Inexpensive and readily available products like flour, instant potatoes, or powdered milk can be added to thicken the soup and increase its nutritional content, while more water can be added to stretch the batch further. If you are able to bake a batch of homemade biscuits alongside a pot of stew on a campfire, you have everything you need for a filling and nutritious meal. The greatest thing about making a soup is that you hardly need to carry anything to make it. If you are fortunate enough to remain in your home during a disaster, you likely have a good stockpile of canned and powdered soup mixes and other ingredients to procure your own broth. Bullion cubes are cheap, packed full of flavor, and can be carried in an emergency preparedness kit to make a quick broth anywhere you find yourself stranded. Salt, pepper, and spices of your choosing can also be carried in small quantities and make a huge difference in making a survival meal edible. Additionally, you can pre-package all of a soup’s dry ingredients in advance to be packed away and prepared later. 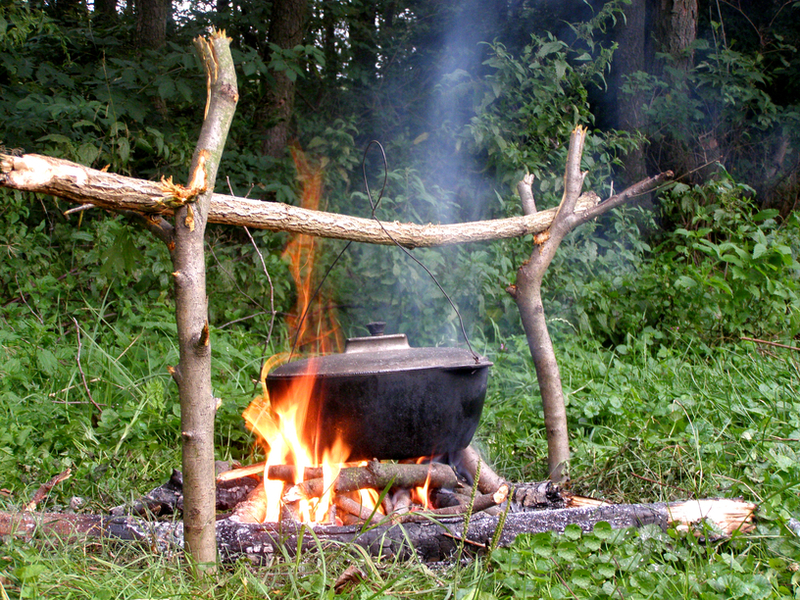 Most preppers carry some kind of cooking pot, or at the very least a small steel cup, so soup can be prepared anywhere you can start a fire and collect water. The options for what you can do with a pot of soup are virtually endless. Fortunately, you don’t need to be professional chef to make a pot of soup and just a few basic and easily packed items can do the trick. Few things serve to lift your spirits in the wilderness more than a warm cup of soup by a hot fire, so start practicing your recipes now so you’re prepared when disaster strikes. Bring water to a boil. Add the chicken cubes and vegetables. Cook for 10 minutes or until carrots are nice and tender. Add the tomato juice and drained green beans.